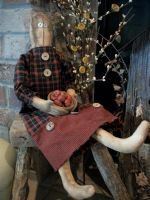 Gracie is 20" tall and can either sit or be hung up. Her dress is made with homespun fabrics. Around the bottom I have attached a strip of contrasting fabric with wooden buttons. The dress fabrics will vary, but will almost always be fall colors. Gracie's face is distressed and has a pinch stitched nose and button eyes. Her hair is hand stitched grungy string. Gracie is holding a wooden bowl filled with pumpkins. 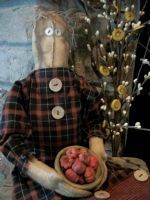 She will make a great addition to your fall decorating or you can leave her out year round. Other dress colors available. Please contact me if you have a preference. Gracie is also available as a pattern so you can make your own. See my Pattern Page. Featured in the 2010 Aug/Sept issue of Country Sampler Magazine. $36.50. FREE SHIPPING IN 48 U.S. Others E-Mail me. I offer $$ off average U.S. Shipping costs.